Google Chrome is one of the most popular web browsers for Windows. However it doesn’t have a master password feature. It means all of your passwords, credit card number, web logins are open for anybody who uses your PC. 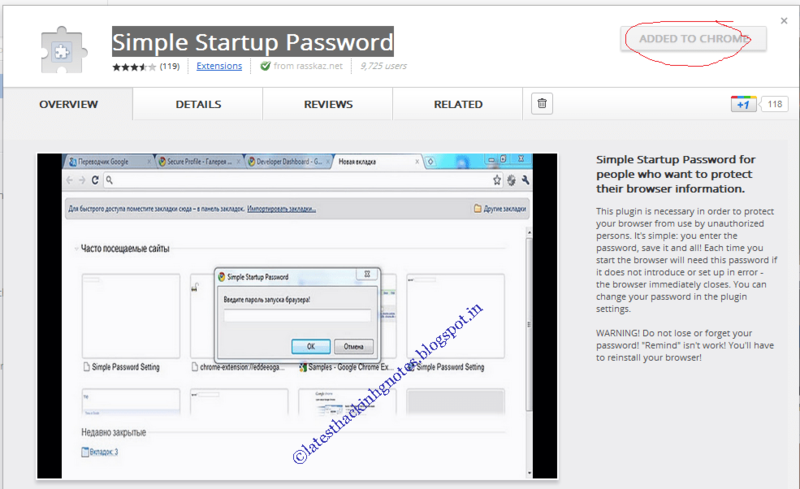 Here you will find out how to protect your Google Chrome with a master password and strong encryption. Actually it is Google chrome extension and you need to install it on your Google chrome browser to use it. This plugin is necessary in order to protect your browser from use by unauthorized persons. Each time you start the browser, you need to fill the password.If wrong password is entered then the browser immediately closes. In order to install this chrome extension visit this link-click here . After clicking on above link chrome web store will open in a new tab.On the top right side click on Add to Chrome button and extension will install in just few seconds. After installing go to settings>options>Extensions and click on options under Simple startup password Extension. Set your desired password and you are done.Now every time you start your browser it will ask for the password. WARNING! Do not lose or forget your password! “Remind” isn’t work! You’ll have to reinstall your browser!